Our Favorite Moments Of 2015: Nicola & David Yoon Interview! In the month of December the Teen Press Corps would like to take a trip down memory lane. All this month, you can check out awesome interviews, more event coverage from the Texas Teen Book Festival, and in-store events! With the holiday season coming close to an end, and the new year around the corner, we want to make sure you’re caught up on all the fun stuff we did this year! One of our favorite moment’s of 2015 is when. . .
Parker Talks With Authors David & Nicola Yoon At The Texas Teen Book Festival! 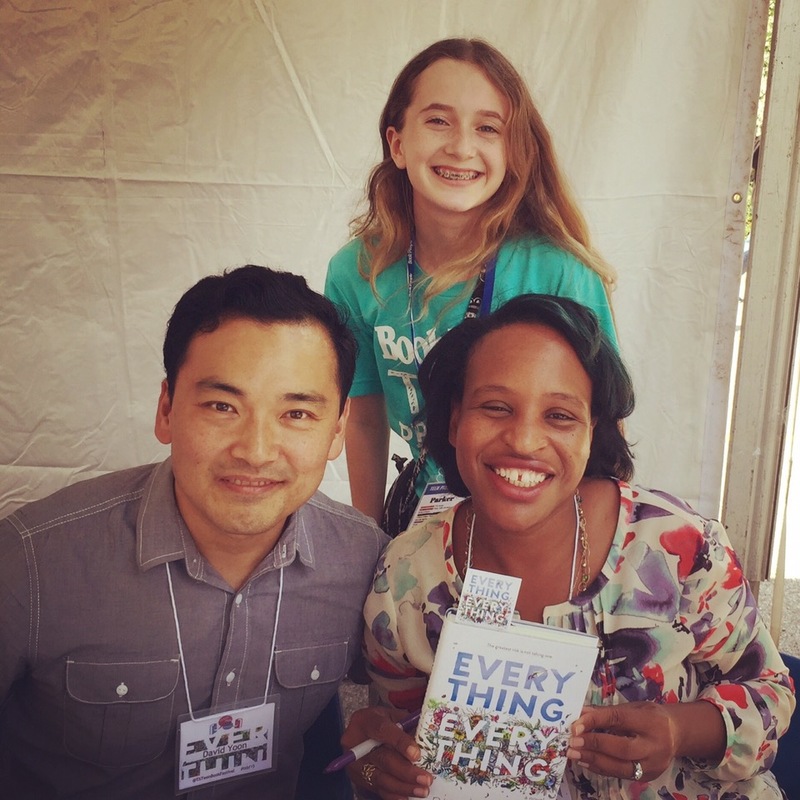 I really enjoyed interviewing the #1 New York Times best selling author and illustrator of Everything Everything by Nicola and David Yoon at the Texas Teen Book Festival! Parker-How do you like Austin? What’s been your favorite thing here so far? David– The hilltop is the best thing we’ve seen. Nicola– Though we saw the sunrise this morning, which was beautiful. Parker- So are you used to cold weather, or no? David– We’re from Los Angeles, so it’s about the same. Nicola– Though it’s very humid down here. So Everything, Everything is your first book? What kinds of writing experience did you have before? Also, by the way, I really love your book. Nicola– Aw, thanks Parker! You’re sweet. So I went to school for writing, so I had lots of writing experiences, and I’ve written a book before this, which will never see the light of day because it’s terrible. Nicola- He says it’s not terrible. I used to write plays and short stories and poems…really bad poetry. David– We actually met in grad school, in a writing program, so we’ve been writing for a long time. 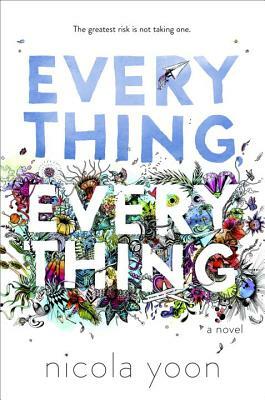 Right now, Everything, Everything is #1 on the New York Times best-seller list for young adult lit. That’s really amazing because this is your first novel. When you were done writing and illustrating it, did you both know that you had made something really great that people were going to like so much? David– I knew we were sitting on something special, because there’s not a lot of books that are like this. It’s a really creative idea! What was your inspiration for Everything, Everything. How did you come up with the story? Nicola– I started writing it when my daughter was four months old, and I was a really nervous momma. I was really nervous about everything. I had been thinking about if there was a girl that was in sort of constant mommy protection her whole life. So that was the beginning of it. David– Because you want to protect your baby, so what if you turned that into an extreme, and how would you cope with it. Do you know anyone with a serious illness like Madeline’s? Did you need to research much about Severe Combined Immunodeficiency Disorder for the book? Nicola– I don’t know anyone with a serious illness. I did a lot of research. It’s not a medical book, so it’s more what you’re willing to risk for love than anything else, but yes, I did a lot of research, and I’ve actually gotten a few letters from people who are seriously allergic to the world, and they thought it was accurate, so that’s really cool. Who are your favorite young adult authors and young adult books? Nicola– That is a very difficult question I will say. David- It’s like choosing among children. Nicola– I love David Levithan, Jennifer Niven, Adam Silvera, David Arnold…and who am I forgetting? David– There’s actually too many good books out there. Nicola– We read a lot. I actually read two books a week. What about you, Parker? 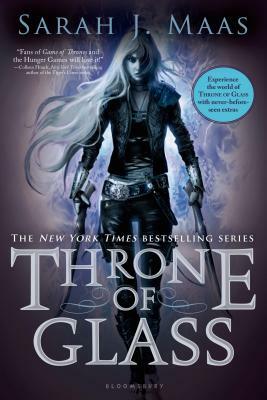 Parker– I like Sarah J. Maas’ The Throne of Glass. Nicola– My gosh, yes, I just finished those! The whole word knows about those books except for me apparently, and I just finished them all; they’re so good. Parker- What advice do you have for aspiring writers? David– The best I’ve ever heard is from Margaret Atwood, and she always said, “Just read, read, read, and write, write, write.” It will inspire you in a way you don’t realize, even if you’re not actively writing. You just need to keep on writing, even if it’s not your best work, you don’t have enough time to sit down at your desk and do your work. Eventually you’ll have a whole portfolio of stories that you can talk about and have for yourself. Nicola– Along with that, you need to finish what you’ve started. For a long time when I was writing, I would start all these things, then stop in the middle, then have a great idea, then stop in the middle, and I think a big part of it is to finish what you start, because then you’ll have something to revise. If you never get to the end, then there’s nothing to fix. Also read lots of different things. Don’t just read one genre. Don’t just read fantasy and romance books. Read lots of stuff; it’ll make your writing interesting. Nicola some of the things you’ve mentioned has happened to me. I’ve come up with a great idea, and then I’ll be writing, and then I just stop in the middle. Nicola– So just go through to the end. Because after that, you give it to people that you trust to advise you, and you’ll get feedback, so you can revise it. David– Even if it’s not great, just finish all the way through. Also you can say, “I wrote a novel,” which not many people can say. I saw the rights were bought to make Everything, Everything into a movie. If the movie is made, will you get to be involved in it—as in writing the screenplay? What actors do you think would fit some of your characters? Nicola– So the rights were sold to MGM, and there is a screenplay writer named J. Mills Goodloe. David– He wrote the screenplay for The Age of Adaline, and apparently he’s awesome, and for casting, we can always fantasize. Nicola– We aren’t actually allowed to say that much because if they cast someone else, that could influence the process, so we can’t say, but I will say there’s an article on Bustle and they did a fan cast, which was really cool. Parker- Was it really fun working together? David – It was awesome. Nicola – Yes, it was really awesome. We had a good time. Nicola– And then I would draw a very, very bad version of what I thought, and he would draw something beautiful. David– Yeah, it was great, and the collaboration was super easy because we’re married, and we love each other. David, have you done illustrations for books before or is this your first? David– This is really my first. I mean, I’ve done graphic design and illustration for clients before, but for books this is the first. And we did a lot. Only about half the illustrations made it into the final book. Also, would you do it again, or would you do it for other authors? David– Just Nikki. (Joking) I would definitely do it again. It’s a challenge, because what you’re creating is a visual puzzle. When you’re reading a book, you’re kind of in word mode, and then you see a picture, and it’s like you suddenly have to switch to visual mode and see how does this picture tie in with the story. And it’s a nice little bit of mental gymnastics to perform, which is what I like about it, so I’ll definitely do it again. What can your readers look forward to from you? Nicola – Well I’m working on a second young adult book, which I think is spring 2017, and I really can’t say anything about it except for there’s a lot of love in there; there’s a lot of love. And then David is working on a book now which is scary, very scary. I read some of it last night, and I could not sleep, actually. Well, thank you for your time! Previous Previous post: THE SWORD OF SUMMER: Norse Mythology At It’s Best! Next Next post: SIX OF CROWS: I Cannot Contain My Emotions!